Registration for the 2019 Games is here! We have 15 different events for all levels of activity. There is a little something for everyone. We look forward to seeing you all soon. CEO of Northside Hospital-Cherokee, Billy Hayes and Cherokee County Senior Olympic Committee Members Wayne Page, Gary Seibert and Sandy Seibert pose for a picture while at the Norside Hospital-Cherokee Strategic Partner Appreciation Event. Diane Page won door prize!! 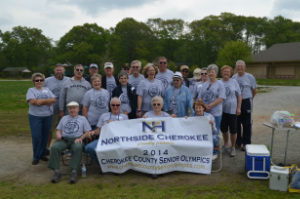 Northside Hospital-Cherokee has been the Signature Sponsor for the past 6 years. 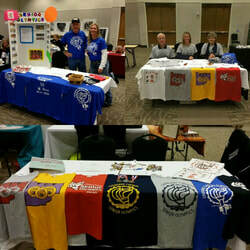 Our booth at the Senior Sense Expo! We do not meet during the month of April because we are having to much fun competing in the games!!! If you are interested in helping keep score, take pictures or assist with an event, please contact us at cherokeecso@yahoo.com. 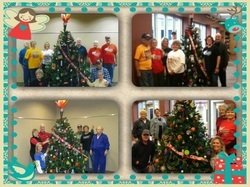 Cherokee County Senior Olympics tree for the RT Jones Festival of trees. Cherokee County Senior Olympics donated over 100 t-shirts from previous years to an organization that gives donated shirts to children in South Africa. Pictured above, committee member Gary Seibert is giving Cornell Taylor a box of t-shirts.